The night before I flew to Miami for a month of service at Americans for Immigrant Justice, I walked the Villa Maria land. It is land the Sisters of the Humility of Mary have lived on for 150 years; land that I had come to know well over my summer working retreat. As I walked the path back from the pumpkin field, I came across a sizable dead garden snake. The snake’s head had been crushed, apparently run over by the wide wheel of a tractor. Mary of Nazareth (Keisha Castle-Hughes) in the film “The Nativity Story” (New Line Cinema, 2006). In contrast to this powerful, heavenly, serpent-crushing de facto goddess, there is another Mary. In St. Joseph Sister Elizabeth Johnson’s Truly Our Sister: a Theology of Mary in the Communion of Saints, we are presented with a real flesh-and-blood woman. In contrast to the white, Western Mary of art Johnson offers the historical, Jewish Miriam of Nazareth. A female in a patriarchal system. Politically oppressed by Roman imperial forces. Pregnant outside of marriage. Poor. A peasant. Displaced by threats of violence. A refugee. To use a term of Peruvian liberation theologian Gustavo Gutierrez, OP, this Miriam of Nazareth was a no persona (non-person) in her society. In today’s language we would describe her as a woman touched by the intersections of multiple oppressions. I thought of this Miriam of Nazareth often during the time I spent accompanying migrant children fleeing violence in Central America. After days spent in court documenting testimonies of migrant children I spent muggy Miami evenings on a porch swing watching heat lightning and reading Johnson’s depiction of Miriam of Nazareth. The resonance between Johnson’s portrait and the stories of migrant girls and boys was strong and compelling. Biblical scholars posit that Mary was likely fourteen or fifteen years old at the time of the Annunciation and the birth of Jesus – the age of many of the migrant girls in immigration proceedings. Miriam of Nazareth in Palestine two millennia ago was vulnerable in a way that the serpent-crushing, untouchably-holy, heavenly-pedestaled Mary can never be. I admit I don’t like this vulnerable Mary as much. The pedestal Mary seems safer, cleaner, holier, and a whole lot less challenging. She remains firmly inside the sanctuary in marble statues and glowing stained glass windows, feet in the clouds, high above my head. Yet maybe part of my own conversion is to embrace this Miriam of Nazareth who is “truly our sister” in our human limitations and vulnerabilities. The incredible vulnerabilities of the migrant girls who have witnessed murders of family and friends, quit school to escape persecution by gangs, left behind all that is familiar, survived sexualized violence in the journey, endured harassment and hunger in the hieleras, and now face an uncertain future as they await the decision of a judge. Perhaps the image of Mary Triumphant is – as her presence in the Book of Revelation suggests – an ultimate, eschatological, future-oriented image. Perhaps the Marian image more needed for our times is closer to the one presented by Johnson – a grittier, human, feet-firmly-planted-on-the-ground Mary, who invites a deeper awareness of our own vulnerabilities as well as a deeper solidarity with those who are extraordinarily vulnerable. When this Mary proclaims her song of praise (Luke 1:46-55) of a God who will “raise up the lowly,” “fill the hungry with good things,” and “scatter the proud-hearted,” it ceases to be simply a lyrical piece of liturgical poetry. The political implications are immediate and challenging. It raises all kinds of uncomfortable questions: Who among us in this time and place is lowly? Hungry? Who are the proud-hearted? Where are the places in my own heart that are proud? How do we act in the Spirit of this justice-seeking God here and now? One of the migrant girls I accompanied in court was a Honduran teenager named Paula who wore – as I do – a medal of Nuestra Senora de Guadalupe around her neck. 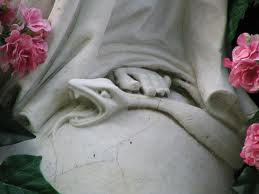 Under the bare feet of the Guadalupe of her medal – and mine – is a serpent, crushed by this powerful, loving mother. Paula gently fingered her medal as she told me her story of traveling through El Salvador and Mexico, crossing the border at Reynosa, being apprehended by the Border Patrol. Subconsciously, my hand went up to my own Guadalupe medal as I took notes of Paula’s testimony. It suddenly felt as though there were three women sitting together in that over-air-conditioned court room in downtown Miami: Paula, myself, and this mother that she and I – across difference of age, race, language, economic status – both claim. Mary is supremely polyvalent – maybe even paradoxical. She is Johnson’s Miriam of Nazareth, the companion of Paula and so many girls and women like her who live extraordinarily vulnerable lives. At the same time, she is that triumphant Queen of Heaven, pointing to a future hope: the promise of the world prophesied in her Magnificat, of a future in which evil in all its forms will be vanquished. This now-and-future Mary at once invites us to struggle in concrete ways for the construction of the future and to rejoice in the glimpses of peace and justice which are granted to us in our efforts. About the author: Rhonda Miska is a former Jesuit Volunteer (Nicaragua, 2002-2004) and a graduate of the Boston College School of Theology and Ministry. Originally from Wisconsin, she spent the last nine years living in Central Virginia where her ministries included accompaniment of the Spanish-speaking immigrant community, Muslim-Christian dialogue, social justice education, direct outreach to people who are homeless, congregation-based community organizing, and coordination of a community with adults with intellectual disabilities. She is currently a Partner in Mission with the Sisters of the Humility of Mary at the Villa Maria Education and Spirituality Center in Villa Maria, Pennsylvania. This entry was posted in Peace & Justice, Spirituality, Women & Gender and tagged Elizabeth Johnson, feminism, immigration, Mariology, Mary, migrant children, Our Lady of Guadalupe, Social Justice by Rhonda Miska. Bookmark the permalink.